The Harvard-Smithsonian Center for Astrophysics (HSCA) has developed an interactive game, Volcano Island, aimed at middle school students to teach about EarthScope-related science. In the game, the user is the mayor of a town on the fictional Volcano Island, home to the rumbling Mt. Leakytop Volcano. You have to decide when to evacuate the town before the volcano erupts using EarthScope GPS units and seismometers, while balancing the happiness of your town people, costs, and timing. 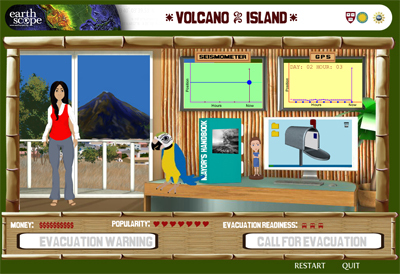 The game employs several interactive features, including placing the EarthScope instruments on the volcano, responding to emails from the townspeople, answering questions at a press conference, and deciding when to evacuate the island. The learning goals for the game include: There are several different types of precursors to volcanic events, including volcanic deformation, smoke, lava flow, and seismic events. Seismometers and GPS instruments can be used to measure volcanic deformation. Warning systems can be developed to help save people from getting killed or injured by a volcano. The population must be aware of the warning system and know how to react. Scientists must make decisions based on the output of the technology to initiate a warning. Volcano Island was developed by the HSCA Space Geodesy Group and Science Education Department, supported by the National Science Foundation. Prototypes of the game were tested at two different stages with middle school students and their comments have been incorporated into this version. Learn more about Volcano Island. Figure 1 - In the mayor’s office of the game “Volcano Island” you can respond to emails, monitor the volcano using EarthScope seismometers and GPS units, and read your Mayor’s Handbook to learn more about EarthScope-related science. 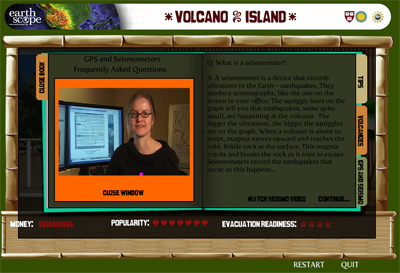 Figure 2 - Scientist Emma Hill explains how to interpret seismographs in the game “Volcano Island”.